The Mirror Orchid is widespread throughout the Mediterranean region but most common in the Iberian Peninsula - the Algarve in particular. The Mirror Orchid grows to around 25cm tall and each inflorescence carries between 2 - 8 large flowers. The plants often grow in groups. In bright sunshine the flowers are highly visible as the light reflects off the speculum in the centre of the lip - it is a bright iridescent purple/blue in colour and very glossy. The lip is three-lobed and bordered by a greenish-yellow border which is surrounded by a band of thick velvety hairs which are reddish-brown. The sepals and petals are green and marked with violet spots or stripes. Ophrys speculum is spread throughout the Mediterranean region, and is particularly prolific in the Algarve region of Portugal. It becomes more scarce in the east.The Mirror Orchid also occurs in Italy, where it is called Ophrys ciliata, and can be found on the Gargano Peninsula. 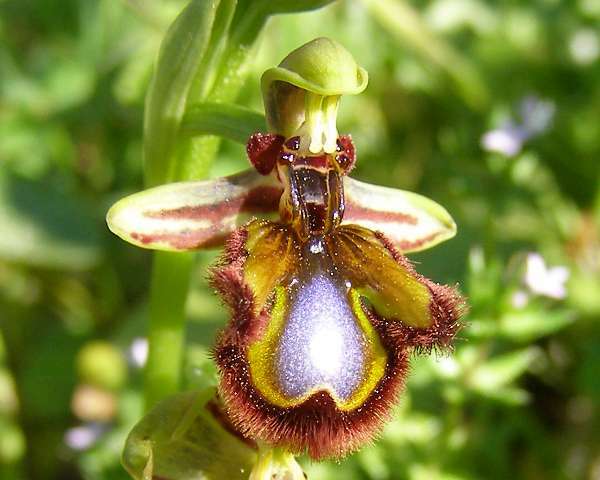 Other countries in Europe where this orchid is known to occur include Spain, Cyprus and Greece. There are two interesting subspecies of the Mirror Orchid which occur in similar habitats and often flower at the same time - Ophrys Speculum subsp. lusitanica and Ophrys speculum subsp. regis-ferdidandii. The latter is endemic to islands in the Aegean. Mirror Orchids flower beside paths and roadsides, in stony and rocky places and also in short grassland on abandoned farmland. 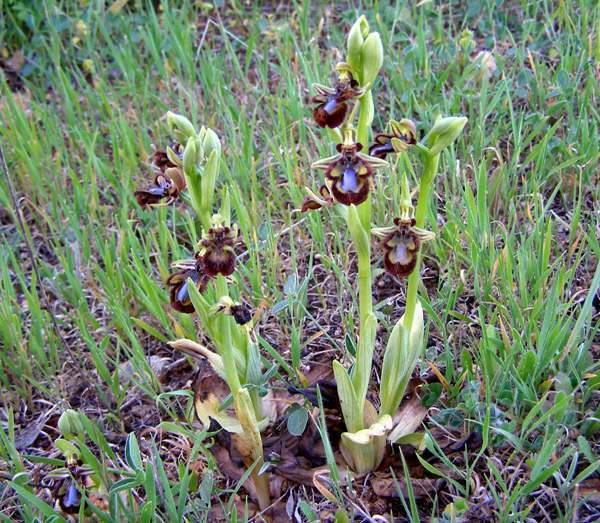 It is often the first of the Ophrys species to appear (from February through to the end of April) although it is sometimes pipped to the post by Ophrys bombyliflora (the Bumblebee Orchid) or Ophrys lutea (the Yellow Bee Orchid) both of which are also very common in Mediterranean coastal habitats. The specimen shown above was photographed in Portugal on the Algarve in mid March.